“Blood emanating from his nostrils” – but it’s okay, he walked off on his own power! Thank You Patrick for your relentless pursuit of the Truth on the Race track. Unbelievable Cruelty . Money is their God. Very tragic. So sorry for FIESTY’S CAUSE & BAMUEL TOI. Two more victims of this cruelty circus, death camp, and corruption pit. These racehorses are merely gambling pawns and ego stokers while they DIE in the dirt. Their stalls are nothing more than torture chambers while they suffer in silence. Folks, this is legitimized animal cruelty, and don’t, for one moment, be seduced by fancy hats, mint juleps, and party atmosphere. The party is over for these racehorses as the killed in action list keeps growing. Thanks to Patrick for his dedication to the otherwise unknown victims of this despicable industry. This is a horrible world of horse abuse, going on forever because of all the big money rolling in and out. Breaks my heart since these horses are over trained and over used for human exploitation. They need to find a different hobby and leave these horses to living a safer and more harmonious life without proving anything to anybody. And the abuse and killing continues unabated. Disgraceful. These horses have no life at the track even excluding the rigors off training and racing . I have a new OTTB and my vet. also has a new 3yr. Old recently arrived OTTB from a rescue in Ohio. Both of the horses don’t have a clue what being a horse is about. They are afraid of everything and normal horse experiences are all new to them. They have no idea that carrots and apple and oat cookies are enjoyable treats. Adjusting will take time–they will learn . Being a horse is sadly forigen to them.. Besides the abuse of racing ,whipping, drugs and joint injections along with pin firing as well as shock wave “therapy”, life at the track is totally unnatural for the horse. It damages them physically and psychologically and all before they reach maturity.. Most horses in this business are finished by the time they are 6yrs. old with nowhere to go because racing does not think beyond the few years they are raced. The survivors are abandoned to slaughter. A few are rescued by people with no connection to the business. These people reach into their pockets .with no help from this heartless wealthy and corrupt business. Congratulations on your new equine family member, Rose! I am so happy for you!…and THRILLED for the horse! Joy, he is beautiful and sweet natured too. It is almost as though he knows his life of misery is behind him. Everything normal is “new” to him. The horse my vet has is doing well and has teamed up with one of her ponies. The vet is allowing him lots of time to just be a horse before doing anything else. On many posts I’ve commented that ALL racehorses are subjected to whipping/beating which is cruel, and inhumane. Moreover, it qualifies for animal cruelty in any other setting in this country. In Ontario Canada, at the “premier” racetrack called Woodbine, since the start of the 2016 race meet, many members of the jockey colony there have been found guilty of a whipping violation. This, in and of itself, is repulsive, and unacceptable. What people need to know is that jockeys can appeal their violation. Most, if not all, jockeys that were found in violation of whipping rules at Woodbine appealed their violation and ALL got a STAY of the violation. STAY translates to NOTHING done, no repercussions, no accountability for beating the crap out of a racehorse when it’s probably tired and/or sore. Out of all the whipping violations levied it is this one that SICKENS me the most. TAKE NOTICE that the Panel granted the stay of RULING TB 9987/16. DATED at Toronto this 17th day of August, 2016. It’s important to note that LEXIE LOU runs at the highest levels of the game. She is an elite racehorse. She is a champion who has made $1,763,538. Despite her elite status, this multiple stakes winner was beaten so badly in her last race that WELTS were visible. They would not elaborate on the “restricted area,” how nice of them. It has been rumored that he whipped her private parts, and this is a female horse – OUCH! Moreover, she has made this jockey lots of money because he gets 10% every time he rides her. He has ridden her for the majority of her races. Yet, this jockey has no problem beating the crap out of her. It’s so utterly cruel, and inhumane. Equally disturbing is the endorsement of this inhumane treatment by allowing this jockey to get away with blatant animal cruelty. NOTHING has changes in this industry – NOTHING. There are only the abusers, and the enablers of the abuse. Thank you Gina for informing us all about these cruel actions. We have seen jockeys hit horses directly in the face as hard as they could with no reprimand whatsoever! The same horse, Last Peak, we then accomplished the fastest time of the day in workout with NO whip! From experiences such as these we left racing in 2005 and we sincerely hope our leaky roof B circuit track goes away due to the higher value for the land being used for other commercial purposes. Our track only survives due to out of state satellite wagering. Actual on track handle is so pitiful that our states county fair meets have higher on track handles at times. We have also seen the illegal use of shock wave therapy used on horses at our local track up to and including the day a maiden, non- winner mare broke both legs at the top of the stretch. We will NEVER forget! That crummy trainer who used the shock wave therapy is still training at our track with his wife as the primary owner right this very minute! Rose Smith is spot on about the horses being afraid of practically everything and requiring MUCH time to become normal horses again. Due to all the joint injections, many horses are damaged beyond healing and repair for future normal lives.We support the ELIMINATION of all tax subsidies for the registering of state foals or the supplementing of purses as is done in our state, from HUB based taxes, on out of state wagers place on races processed through several internet based companies. How could the whip hit her private parts? It would have to bend all the way up in between her legs. I just don’t see how that is possible. The restricted area was most likely on her belly region. and ruling said welt not welts. the belly region is sensitive that’s way it’s a restricted area. it would only need one hit to welt. The point is we shouldn’t have to guess where exactly he hit her. I think it’s a deliberate effort on behalf of the industry to classify as a “restricted area,” so that it doesn’t sound as bad as it was. That said, it’s horrific no matter what way you cut the cake. This is an industry that legitimizes animal cruelty. A welt can be the result of one severe hit inflicted with great force and many jockeys have got this down to a fine art. One welt can also be the result of more than one hit in the same spot (repetitive). The whips have a degree of flexibility in them and can hit the private parts of a horse, a restricted area. Mostly horses are struck in the flank area which is prohibited under the international racing agreement because it’s a sensitive area (similar to under our arms/rib area) for the horse. Needless to say, the stewards turn a blind eye to this abuse thereby condoning this cruel practice. A few years ago the RSPCA in Australia did a study on whipping and found indisputable evidence of a horse being struck on his private parts (footage slowed right down for proof and viewed on a national TV news program). Also evidence was found of horses being hit on the head. No guessing on where she would have been hit, all one has to do is watch the replay. I’m sure in the heat of moment the belly region was not where he intended to hit. jockeys in Canada are only allowed to strike three times in a row and then must ride them before being able to strike again. she was hardly being beaten to win. Wow Maggie another racing apologist. 1. Your claim that watching the replay will confirm where she was hit. Wrong. It depends on the placement of the horse,the placement of the camera angle. I’m sure the camera angles are deliberately positioned for lack of transparency. Probably another lack of transparency tactic. So watching the replay doesn’t necessarily confirm where Lexie Lou was beaten. I thought I would mention her name, out of respect, something that you never did. She does have a name, and it’s LEXIE LOU. She is a champion racehorse that made over 1 million dollars. Nobody can confirm this claim either. It could have been intentional, but to explain away a jockey beating a racehorse in the “heat of the moment” is morally reprehensible, and you should hang your head in shame. Moreover, striking a horse in the belly can initiate colic – a life threatening situation. Furthermore, a jockey has to go out of his or her way to strike a horse in the belly. It’s hardly a mistake as you imply. These racehorses are tired, are slowing down and/or possibly sore. They are PROTECTING themselves, but they are being beaten to ignore these signals. That’s what this is about. 4. “She was hardly being beaten to win.” This is disgraceful. How dare you defend this blatant animal cruelty? This is slavery – plain and simple. These racehorses are profit slaves who are beaten with a whip to fatten someone’s wallet or ego. In fact, this strike of the whip was so hard it produced a welt. How dare you defend this? Of course the connections of the racehorse (Trainer/Owner) remains silent about her beating that produced a welt(s). Therefore, they fall into Category 2 – enablers of abuse. The only thing that could have mitigated this animal cruelty is that the commission suspend this jockey and/or levy a heavy fine – and you know what they did? They granted his STAY just like they have granted the STAY of almost all whipping violations during this 2016 race meet at Woodbine. Absolutely abhorrent, repulsive, and morally reprehensible. The very agency that could have deterred this behavior let the racehorse down once again opening up the flood gates for this blatant animal cruelty to continue. If they don’t protect a champion racehorse like Lexie Lou then no racehorse is being protected. So the commissions fall into Category 2. They are the enablers of the abuse, and there is no better example than this – sadly for Lexie Lou. you are an enabler of this abuse. You, like all other racing apologists, are enablers of the legitimized animal cruelty, and abuse. It only seems reasonable that anybody who truly “cared” for their “family member” would be outraged at this ruling, or lack of ruling, that condones the ongoing beating of racehorses who are tired and/or sore. This industry is going down, and for every racetrack that closes down that is one less racehorse being abused. So very well said, Gina! It actually says right in the ruling where she was hit. She was hit in the hip of her right flank. I know her name I have met her many times before her retirement this year. I ride horses and have accidentally misjudged my placement of a strike with the crop. I don’t believe it is that hard to do. it is a tool used in all riding disciplines whether one likes it or not. It is an approved tool, just like spurs. any equipment in the wrong hands can do damage. The point I am making is how you blow things out of proportion. If the industry is viewed as bad by someone then there is no need to blow things out of proportion. When that is done it makes people distrust the information whether good or bad. The fine will hold as it always does. There was no suspension. I mentioned the use of the whip rule only to point out what it is and hopefully give some insight as to why unlike many other tracks woodbine has a lot of violations here. They are also fined if the whip is continued to be used when the horse is not responding. I do not believe racing will be a thing of the past, it will just become more for the elite and people should be working toward getting changes made. I have provided you with the ruling that specifically states “restricted area.” So unless you can provide the ruling you are referring to that states “right flank,” then you are not providing accurate information. You always seem to omit the WELT that was a result of this beating. Moreover, since this industry continually omits facts from the public it’s very possible that there were more than 1 welt that we don’t know about. Besides, the point is, these racehorses are getting brutally whipped and beaten on a daily basis to perform. So I guess your racing apologists think that whipping a sentiment being to perform is because they “love to run,” – right? You have to be either deaf, dumb, blind, or delusional which most of you are to think that a horse loves to run when they have to be beaten to do so. Moreover, this ruling clearly demonstrates, that despite any rules, people in the industry are not held accountable for blatant animal abuse. In fact, almost every single jockey has got a STAY since the 2016 race meet as of last week. Again, if you can provide the amount of the fines, via an official ruling, feel free to do so because so far there isn’t a whipping fine associated with this violation or many others on their website. The point is there should be no stay – just suspensions. So instead of you focusing on a sentiment being beaten to fatten wallets, even dying for bets, you discredit me – somebody who truly cares about racehorses. I’ve dealt with you people for so long it’s you are all absolutely pathetic. Your modus operandi of character assassination just shows how desperate you all are. Every time one of apologists comment on this blog it shows your true colors. Since it’s so easy, according to you, to beat a horse in another area then whipping should be banned, and trust me that’s coming. We banned the bull hook, and we will ban the whip. The ONLY reason why Woodbine is still open, or many racetracks throughout North America, is due to corporate WELFARE, and financial support from either taxpayers or casinos. This will end, and when it does racetracks will start shutting down one by one just like dominos. For every one that shuts down, there will be many of us cheering because we know that it will result in less racehorses being whipped/beaten, doped, maimed, dumped, and/or killed. Since you have revealed that you have whipped horses in various areas of the bodies, you now fall in both Category 1 and Category 2 – congratulations. I never claimed to beat a horse, only that sometimes a strike is misplaced. I did say, I myself has misplaced a strike. The whole issue I have is not with anyone’s opinions we are all intitled to our own opinions of what is wrong with the world. The way is which things you precisely Gina, blow things out of proportion. the very same ruling that you looked at said the restricted area and the fine to be paid. I have a screen shot of the one I read, but can’t upload it here. The fact is that in order for your movement to move forward you need all the support you cam get. But when you blow things out of proportion it makes people less likely to believe in your cause. The fact that you feel just in telling who ever stops by with a different opinion then yours does not help your cause. I am not the only one to point out some inconsistencies nor am I the only one you have twisted words with. I will gladly send you the ruling I have. there are many things that need to be fixed in the entire horse world I personally am not trying to discredit anyone only to provide the facts that I know. I don’t attack anyone or bully them, I’m just merely discussing the information that I have come across. I provided the official ruling to back-up the facts. A fine was listed $1500, but a STAY was granted. So nothing has been done about this whipping/beating that resulted in a welt. You said you couldn’t download the ruling that disputed mine in order to back-up your claims. Thus far, you have no credibility. You state that you have “struck” a horse in a area by mistake. I call it “beating” a horse. So your disputing semantics not the facts. Striking a horse is too nice of a term for what amounts to blatant animal cruelty, and would be punishable by law if this took place in any other setting. For example, a dog being whipped in a parking lot would garner a Felony Animal Cruelty charge. 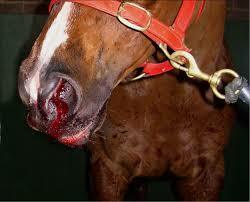 All racehorses are subjected to whipping/beating, doping, maiming, dumping, and/or dying at ALL levels of the game. All industry supporters and/or participants are either 1. Abusers 2. Enablers of the abuse. I’m amazed at how you racing apologists attempt to discredit the messenger. Gina…they attempt to discredit the messenger because they’ve got nothing else. No I said I could not post it here. I have a copy of the ruling. I use a crop while riding yes, and I have hit the wrong spot as well as myself while riding. its used as tool in riding. Much like the spurs. to imply that I beat a horse because I use these tools is ridiculous. They are used in all disciplines. I did say, I myself has misplaced a strike. The whole issue I have is not with anyone’s opinions we are all intitled to our own opinions of what is wrong with the world. I am not out to discredit anyone we are all entitled to our opinions and beliefs, just provide you with information that you may not be aware of. But you always go on the attack, which is why you will have a hard time for your cause, despite having what you feel is the best of intentions. At the end of the day attacking people will not make them change their views but reforce what they already think of people trying to make changes. Maggie…some issues are independent of opinion – not to say individuals don’t have their own opinions but rather, regardless of one’s view, there is right and wrong. And causing pain and suffering to a sentient creature – ANY creature – is simply and undeniably wrong. I’m a broken record when it comes to this topic of animal exploitation and abuse, but I’ll say it again – the horse racing industry is unnecessary. It’s bad enough that horses are beaten with whips and shocked with buzzers, trained, ridden and pushed to compete before physical and mental maturity, isolated and confined, crippled and killed…but THEN, all for the entertainment of fans and betting fixes of gamblers? How depraved ARE we as humans if we find hurting voiceless and defenseless beings acceptable for entertainment purposes? If I copy and paste it you will deny that it’s an official document that is why I want to post the official copy from the orc ruling. Thank you Joy for putting it succinctly. Take away the opinion, and you still have a morally bankrupt business that uses, and abuses racehorses for bets. This is wrong, and that’s why this blog is called horse racingwrongs. through the ages man /women pathway to glory has been through the bones of a horse and it still is.